In the original year dot the Earth was a healthy planet, but over time humans have multiplied, made some poor choices and the Earth is now in crisis. How do you fix a planet, where do you even start? Actually, it’s simple; you download an app and you Do One Thing. The #DotChallenge is an acronym for Do One Thing and works on basic maths. I can commit to saving 3500 litres of water a month by having a shower instead of a bath. Big deal. But if a hundred or a thousand or a million people in my city do the same thing, it makes a huge difference. Once you start making small changes to save water, conserve energy and reduce waste it starts becoming a way of life. The DOT app provides ideas or DOTS that you can commit to and covers everyday actions relating to water, waste, energy and conservation. It is an easy way to create awareness, start conversations and change mind-sets and habits. The app was launched on 1st January 2017. Download here for Android and here for iPhone. When the world goes dotty it will be a good thing. For a full explanation of the DOTChallenge and the app, click here. 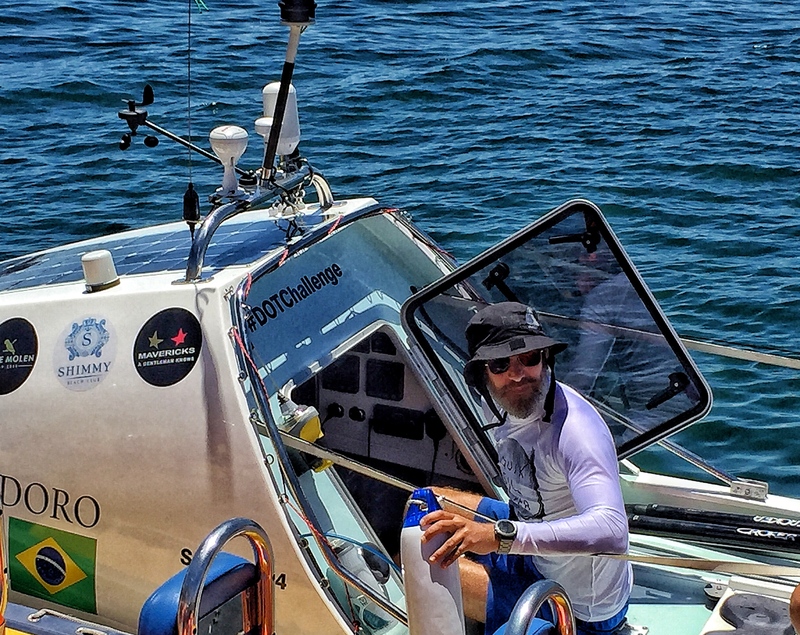 Two intrepid adventurers will be rowing the Cape to Rio route to raise awareness for the DOT Challenge and you can follow their progress on the app, and see the number of dots grow as more people download it and start adding their dots. 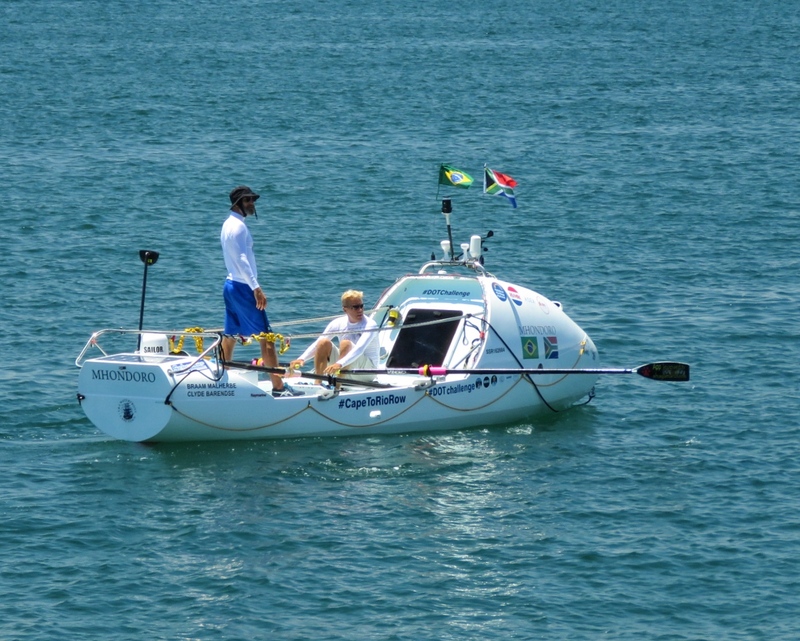 Clyde Barendse and Braam Malherbe will be rowing 6700km over 2 to 3 months in this tiny craft, the Mhondoro. The boats weighs about a tonne fully laden, which is quite a weight to propel by rowing. It has a tiny cabin that contains the navigation equipment, charts, personal gear, a tool box, medical kit and provisions. There is just enough space for one person to curl up and sleep or two people to sit with the door closed during extremely adverse weather conditions. On the other end of the boat is a much smaller cabin that houses the auto and manual helm that controls the rudder. The rudder can be programmed via a remote by Braam or Clyde while they are rowing. During rough conditions and large swells the back rudder will be used to allow the boat to surf the waves. Approaching the waves side on would cause the boat to capsize, although it is designed to automatically right itself. The rest of the space on the boat is taken up by the two slide rowing seats. For the entire duration of the trip Braam and Clyde will be strapped to the boat. The days and nights will be a never ending cycle of eat | sleep | row | repeat. The boat is stocked with freeze dried food sufficient for 90 days. Only 30% of the meals are wet food, and are of the boil in a bag variety, cooked on a Jetboil in 3 to 4 minutes. The average meal contains 800 calories and extra treats include biltong, almonds and macadamia nuts. This is not a foodie adventure, its pure survival. Water will be obtained via a battery powered Schenker Water Maker. The battery is charged via the solar panels on the top of the cabin and the hatch. A hand operated water maker is on board as a back-up. To break the endless eat, sleep, row routine, Braam and Clyde will take turns to go overboard into the sea every day, attached to the 40m line. 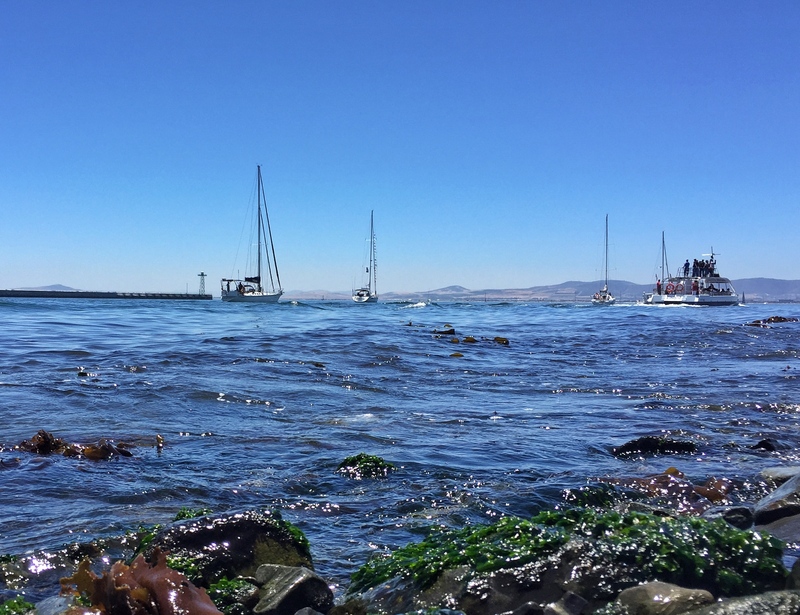 This is bath and toilet time, recreation time and a chance to observe and record what is happening in the ocean. They will be taking photos and video with a GoPro Hero 5 and a low light 4k camera. The 1st January was the planned launch date but poor weather conditions prevented Clyde and Braam from starting their epic journey, and they are still waiting for the go ahead from the weather gurus. 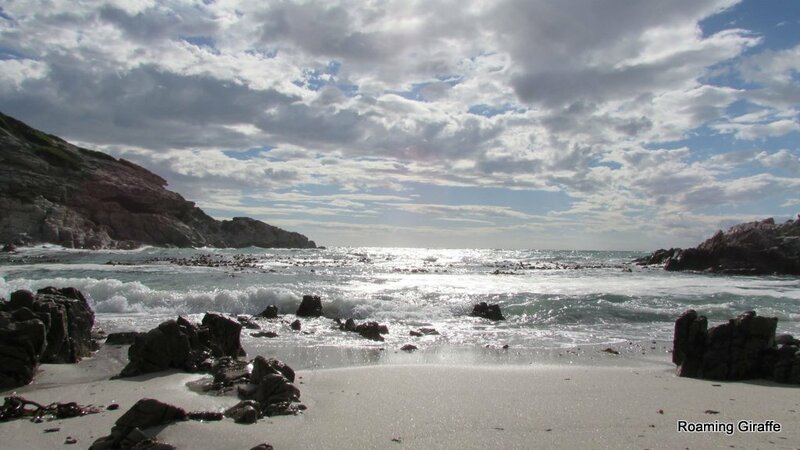 Download Windy.tv This is a great app to see how wind, currents and swells will affect their trip, and give you your daily weather where ever you may be. Earning your stripes is so last year, get out there and go dotty. I have downloaded the app and created my profile. I challenge all my blogger friends and every one of my 98 000 Twitter followers to do the same. I can’t fix the planet but I can DO ONE THING. Voice map, it’s like having a local guide in your ear.